Located across the road from Poniente Beach, the Benibeach Torre Apartments are ideal for larger families looking for spacious, well equipped rooms close to all amenities. The pool offers a relaxing way to cool off from the Benidorm sunshine while sporty holidaymakers could find the tennis court a must. All apartments are equipped with a fridge. service includes towel change every 4 days and bedlinen changed weekly. 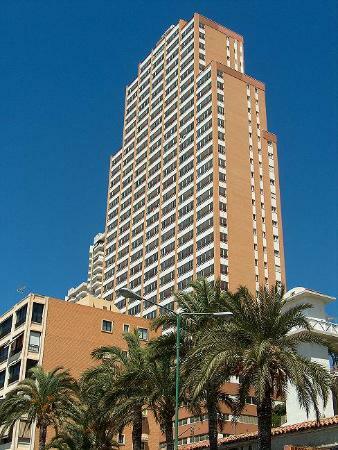 The Benibeach Torre Apartments are unsuitable for the less mobile type of tourist due to it's location. We booked the holiday before reading any of the reviews about the Beni Beach and so after reading were left wondering if we had done the right thing. On reflection, I think we made a good choice! Our apartment was clean, basic but had everything that a family needed. The apartments provided us with a good base for our holiday. There was a bar, but as usual in hotels, this was empty most of the time as most holidaymakers went out. Given the low cost of our holiday, Benidorm exceeded our expectations. I would certainly go back and would recommend the Beni Beach to anyone who does not expect five star.